Superhero costumes always seem to be tricky in real-life adaptations. Thankfully, Netflix's Daredevil does an awesome job in not only the costume department, but the entire show overall. ​I was originally going to wait to write this guide - I figured I'd wait until the second season had started (assuming there will be one, I honestly think this show is too good not to have more seasons). But I think I have a problem...I'm a bit obsessed with this show. 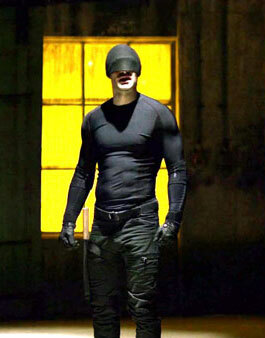 I couldn't help myself, I started re-watching the show, and as I watched, I looked around for any information on Matt Murdock's black Daredevil costume. While looking around, I also found a lot of information on Matt's normal lawyer clothes. ​After some quick Googling, I found this interview with costume designer Stephanie Maslansky, which shed some light on quite a few pieces of Matt's costume. ​Apparently (and thankfully for those of us who want exact matches when possible) the costume designers had practicality in mind when designing the black costume. They wanted items that Matt would be able to get ahold of himself at the time, and that would also make sense. ​She reveals that the shirt is a compression shirt, though no mention of brand. My first thought was to look at what Under Armour has. It may not be obvious at first glance, but there are actually quite a few design details in the compression shirt that Matt wears. Those details are missing on Under Armour's compression shirts. ​If you know you want to go with Under Armour and you're not concerned with an exact match, then I'd suggest this all black Under Armour compression shirt. ​I actually found a couple of different compression shirts that I thought looked pretty close, but then I came across the RPF thread on Daredevil's costume. It seems obvious/common sense that when Matt was buying his shirts, he'd buy more than one, and on top of that, more than one style/brand. That being said, it does look like the shirts he wears do change a bit throughout the season (they get torn to shreds quite a bit). One of the exact matches I know of so far is the ​McDavid 8840R compression shirt, unfortunately it's already out of stock and no longer in production. ​If you're going for a complete screen accurate costume, then I'd go with this McDavid 8800R Compression shirt. If you look closely, you can see hexagonal patterns on Matt's black compression shirt. Combined with the red stitching, it looks like this compression shirt is another exact match to the one worn on Daredevil. ​I actually ended up ordering a couple different brands of compression shirts, but only because the reviews on the McDavid one seemed a bit iffy. Of course if you're only concerned with screen accuracy and not comfort or function, then reviews really don't matter. ​My last recommendation is this Tesla compression shirt. Again, it's not an exact match, but it got such good reviews that I felt like I had to give it a try. ​Again, the costume designers went for function here. Stephanie Maslansky said, "...his pants wound up being from an army/navy store. I think they might have been construction pants." ​Although it's great that costume designers are doing these interviews and giving out information, I wish they'd give some real detail. So instead we're left with the not quite as accurate method of comparing screencaps. ​Basically what I ended up doing was searching around Amazon for black cargo construction pants. One of the closer pants I could find were these Tru-Spec tactical pants. These definitely aren't an exact match. One of the most obvious things being that Matt's black pants have a zipper near the top. ​The second pair that I found that I really liked are these Tru-Spec cotton work pants. They look a lot like the other Tru-Spec pants above, but without the knee pads. ​Finally, the closest match that I could find are these cotton slim-fit military cargo pants. Not only do they have great reviews, but they look really close to the black pants Matt wears. Just make sure you select the right black option, you want the one with the zippers. ​This "Man in the black mask" costume that Matt comes up with offers almost zero protection. ​He explains at least once that he doesn't want to slow himself down with body armor, he doesn't even use anything as protective as hockey pads. Matt simply uses athletic pads and tactical gloves. These items are all confirmed screen accurate, but only by comparing screenshots with real items. You'll notice that the hex pattern on the forearm and elbow pads matches the McDavid products exactly. It looks like they only covered up the label. You can find the Ringers 557 gloves on Amazon, but they're overpriced right now (about twice what they should be). ​If you want to buy everything from Amazon and don't mind being non-screen accurate, then I'd suggest these Ringers 577 tactical gloves. ​The black belt that Murdock wears with his crime fighting outfit looks like your standard, one size fits all webbed belt. And according to the guys over at the RPF, that's exactly what it is. This canvas cotton web belt looks identical to the one Matt wears. ​The black, webbed material of the belt itself looks the same, and even the silver belt buckle matches. It's a pretty safe bet that this is the same belt worn on Daredevil. ​Daredevil's boots are definitely made for kicking, I don't think an episode goes by without Matt kicking one of the bad guys in the face. And what better to kick a dude in the face than composite toe tactical boots? ​Like the rest of this ninja costume, the boots are very functional, but off the shelf. Matt's boots are a composite toe tactical boot with a side zipper, meaning they're made for getting work done, not fashion. ​Wondering exactly which boots Mr. Murdock went with? They're Bates Enforcer composite toe side zip boots. Bates is a pretty well known boot manufacturer, and even more importantly, they're known for quality craftsmanship, so this is definitely an item I wouldn't skip over. In the interview with Daredevil's costume designer, she says that the mask is made out of a cotton mesh, "Layers and layers of it." So basically we have to come up with something on our own. The closest (and easiest) thing I've been able to come up with so far is women's spandex leggings. I admit I felt a little silly trying it, but it looked good. I'd suggest going with something relatively cheap, like these ​cheap women's leggings on Amazon. You won't be able to clearly see through it, ​but you can see well enough to get around. The biggest problem I had when choosing a material for the mask wasn't how transparent it was, but how it conformed to my head/face. If you buy something made out of a material that's too stretchy, it molds to your face too much and resembles more of a half Spider Man mask rather than Daredevil's mask. That being said, the more cotton in the fabric, the better (it'll match Daredevil's look more accurately).​ The leggings I linked above are 95% cotton and 5% spandex, so they work really well. Hey man, THANK YOU so much for this article. I have just under a month to get this costume together for a con and I was staring at different shots trying to figure out what each piece of his look was. Your breakdown is immensely helpful and a sigh of relief to me as I now just have to order everything and toss it all together. Thanks! Have you found out anything about the sheath for his sticks? May be a stupid question, but what arms does he wear the hexpads on? Does he wear a pair or one on one arm the other on the elbow? He wears a pair of both the elbow pads and the forearm pads. So one on each elbow, and one on each forearm (they’re two separate products).